Typically, the fingers become progressively stiff, painful and swollen, and bumps may develop on the finger joints (called Bouchards or Heberden’s nodes). In the case of the thumb you may have trouble gripping or pinching things with any kind of strength, or trouble opening lids or turning keys. Risk factors include heavy usage, traumatic injuries that cause joint instability and misalignment. 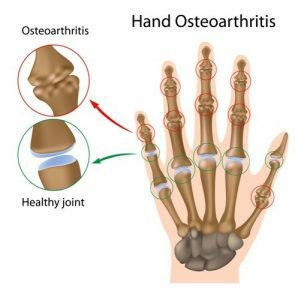 Some people may also inherit genes that predispose them to develop OA. Treatment for OA includes. Osteopathy can be useful and employs gentle massage and mobilisation techniques.